Snow boarding. 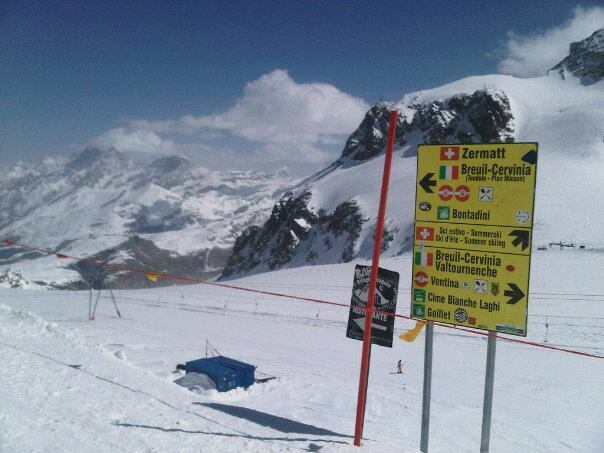 When we arrived in Cervinia 2 weeks ago it was already dark and 11 o’clock at night. I couldn’t see the mountain, but the town was covered in snow and I was thrilled. We got to the flat and started unpacking while SF (Simone Ferradini) started throwing together a quick dinner. The place was small but it was perfect with its little fire place and open plan kitchen and living area. There were two balconies with big glass doors opening out onto them, giving you an amazing full view of the snow covered mountain during the day. The two bedrooms, one with a double bed and another a bunk bed, were cosy and warm with their heaters and carpet covered walls. They both had beautiful shutter windows overlooking the snowy forest at the back. Having gone from Cape Town (sea level) to Florence (140 ft above sea level) and then to Cervinia (6581 ft above sea level), my head was spinning slightly so my sleep that night was restless. Luckily I had some Oscar Peterson to calm me down and sooth me to sleep. The next morning we got up at 7 o’clock. After making breakfast and getting me geared up for snowboarding, we set off. 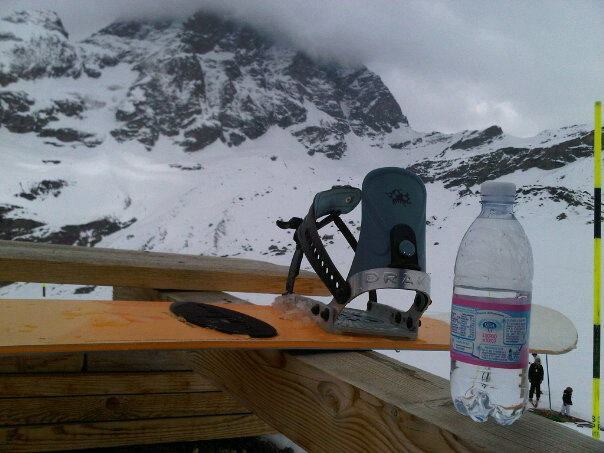 I was using SF’s snowboard and boots ( which was two sizes to big for me but I didn’t have the heart to tell him, he seemed very anxious to get on the mountain). I only snowboarded once before in my life 7 years ago, and my sister informed me that even then I wasn’t any good. But I thought it would be the same concept as riding a bike, it will come back to me. Well it didn’t. When we got off our first lift at the main central of the mountain, there was a mini slope for beginners and children. SF had been giving me skeptical looks and nervously suggested that I first try the mini slope before attempting the bigger slopes with him and Camilla. So eager to show them my skills I strapped my boots on my snowboard and headed for the slope. In seconds I was all over the place and chaos unfolded in my wake. I nearly knocked a three year old right out of his mini ski’s before he neatly dodged out the way, glaring after me. I body slammed straight into an instructor who neatly caught me. My hero I thought. But instead of getting me off the slope, seeing as I was clearly hazardous, he gave me a wicked grin and a little push back down the slope. So I glamorously zig-zagged all the way to the bottom were I came to a very sudden and rather painful stop. As I fell I could hear a chorus of “Oooh”‘s rising behind me. Embarrassed and bruised I lifted my face from the snow to see if I caused any casualties. The whole slope had frozen and were staring at me with utter disbelief, others with sympathy and some were just having a good hard laugh. I got a few glares as well from mothers mostly, and I vaguely remember swearing all the way down. At the very top stood SF and Camilla. Camilla had both hands over her mouth revealing only two large eyes, and SF had one hand on his hip and the other was on his head, eyebrows raised and smiling at the few people looking at him, having connected them to me. I inelegantly rolled to my back and threw my head back in the snow, closing my eyes praying for an avalanche or some other disaster bigger than mine. I crawled snowboard and all onto this band thing at the side of the slope that takes people back up the slope. It was the worst kind of walk of shame I have experienced up to date. The band was moving painfully slowly making it impossible to run away from all the eyes bearing down on me. So putting on a brave face I smiled and nodded to every stare I came into contact with. 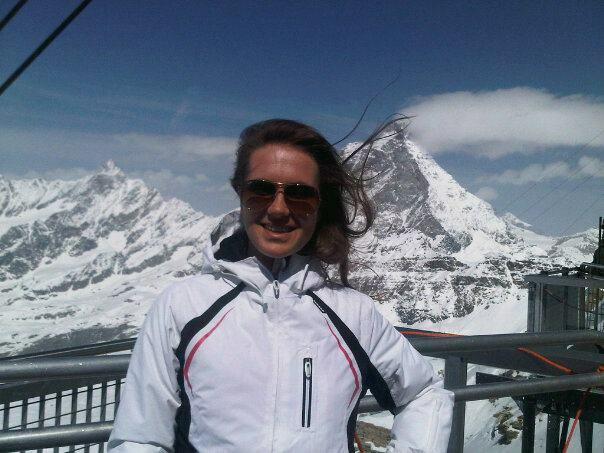 When I reached the top of the slope SF smiled sympathetically and suggested a few lessons before I try anything bigger. I booked their only opening that day from 1pm-3pm. Seeing that it was only about 11am still, I rode the series of different lifts with SF and Camilla to the very top of the mountain. 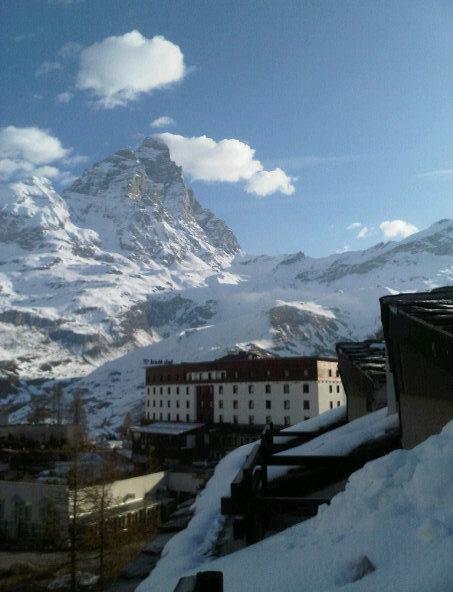 We stepped out of the lift into Switzerland and it was amazing: Mount Cervinia, being one of the highest peaks of the Alps, gave you a splendid view of the Alps. It was a cloudless sunny day and everything was crystal clear. And then we stepped into Switzerland. Standing on the highest peak and high on life. SF and Camilla skied down but I hang around a bit, having a caffé and marveling at the view, before I took the lifts down again. By the time I got back down it was almost time for my lesson so I hung around at the beginners area watching everyone else embarrass themselves. It was great. When my instructor arrived I was delighted! He looked like a SA surfer in snowboarding gear. He was super tanned with dark blond hair sticking out from under a pink bandana, mirror sunglasses and a friendly smile. His name was Paolo and I immediately liked him. We started our lesson and he would heartily laugh when I fall, slapping his knees, making me laugh too. But he would also fiercely praise my good runs, making me feel like a champion. At on stage I got a little fed up with falling so often and so hard that I lay in the snow, having a semi tantrum kicking up snow, cursing myself. Paolo only patted me on my shoulder and said that I was not falling so much because of clumsiness but because I was fearless. With his limited English vocabulary he probably didn’t know what he was talking about but I didn’t feel like correcting him. He then carried on explaining that I have accomplished in one day what takes most weeks to learn. Of course they didn’t fall as much as I did because they were more careful but it took them much longer to learn as well. Basking in the praise I felt much better by the end of the conversation so I got back up and continued. I was boiling so I peeled of layer after layer of clothing. I ended up with only my big padded pants (which were needed), a black tank top, my hair in a rough bun on top of my head and my aviators perching on my nose, sweating like a pig. I drew a few comments but I was too busy trying not to fall that I didn’t pay them any attention. 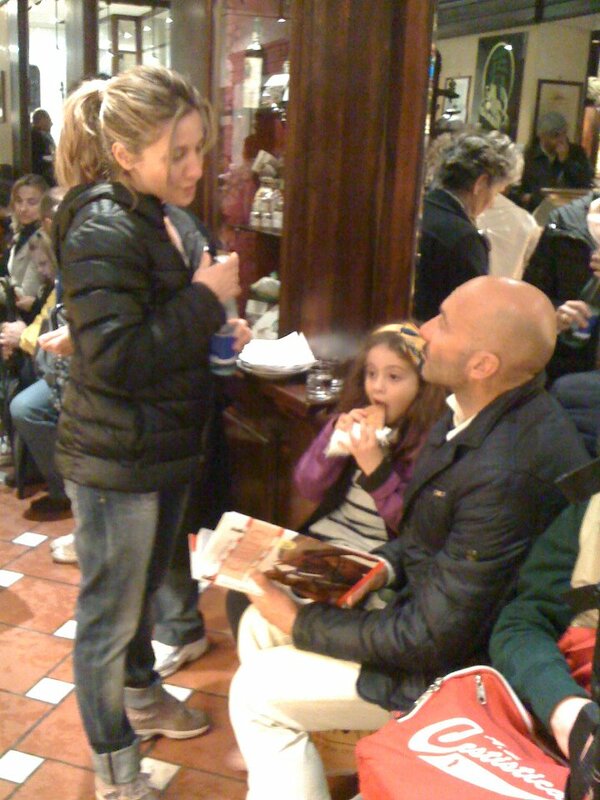 At one stage Paolo shouted something in Italian at them and they were quiet. He himself was wearing only a T-shirt seeing he had been running after me the whole time like a nervous dad running after a toddler taking his first steps. I had a proper sunburn at the end of the lesson and his absurd tan made a bit more sense then. With a high five and a few last jokes we parted ways. I walked a few yards and collapsed in the snow. 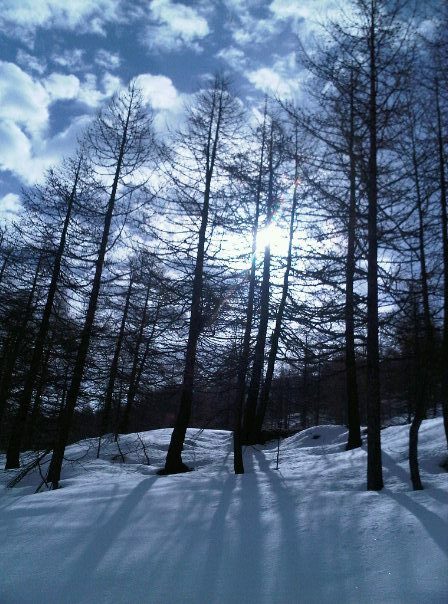 I lay there in the snow for a while staring at the mountain while waiting for the others to finish their slope. I met up with them for a pizza and a cola before we headed back home. Chilling in the snow, mesmerized by the mountains. I was exhausted and passed out as SF and Cami played Monopoly. When I woke up SF had already started making dinner so I eagerly jumped in and helped were I could, feeling guilty. After dinner we watched an adorable movie called La Boum. It is originally a french movie but we watched it in Italian while drinking amazing local wine and eating all sorts of delicious dolce’s. We all laughed and talked through out the movie seeing that they had to explain a joke every here and there. After the movie I took a shower in a bathroom that was twice the size of my room with an elaborate shower containing seats, 6 different shower heads from all angles and a built in stereo. The next morning we went through the same routine but this time we hired me some boots that actually fit and it made a big difference. SF, having watched only a portion of my lesson the previous day, deemed me ready to do a slope with them. If my memory serves me right it was a red slope, the second most difficult slope after the black one. Me not knowing this at the time felt fairly confident. Off we went and everything started off alright but it only got worse. I had about 3 really bad falls. One had my nose bleeding a little, another had me seeing stars but the last one was the worst. I was coming down a slope which had a dip at the end so you had to build up good speed to make it out this dip. Just as I was going really fast I slightly shifted my balance to the front because I was getting a cramp in my back calve. Just like that I lost my balance, brought my board into backside to attempt to break but instead the front of my board hooked snow and without being given a chance to register that I was falling, I was out. I couldn’t breath, seeing that the wind was knocked right out of me, and as I shifted to my back I couldn’t focus on a thing. Luckily SF and Cami weren’t there to witness my epic fall but instead I had a group of strangers huddling around me, making unnecessary fuss. They were speaking all kinds of languages above be but none of them were English. Just my luck. I was trying to get my breath back to tell them to f*#k off (seeing that it is universally understood) when Paolo’s head appeared above me through the clutter of faces. He burst out laughing when he saw it was me, then ushered the crowd away, telling everyone that I was fine. With the people gone it gave me space to get up. Paolo helped me up with a grin that only deepened when I scowled at him. Suppressing laughter he asked me if I was okay and what had happened. I told him if I had implants they would be burst by now and I might have broken a few ribs. He laughed and poked at me, asking were it hurt while I grumpily slapped at his hands. As he dragged me the last way down, I explained how my slope went and he never lost his cheeky grin. When we reached the bottom he had a lesson to give so I went to go pass out in the snow once again for a power nap. I was woken by Paolo roughly nudging me with his foot, telling me to get back on my board and do a few rounds at the beginners slope otherwise I’ll regret it tomorrow. Bitching and moaning I did a few rounds. The worst part were coming back up on the band. You had to stand in one uncomfortable position all the way up while your whole body cramps up and the band moving painstakingly slowly. In the end I took my board, went to one of the restaurants and had a pizza and a glass of wine but I had a grin on my face. It had been a good day. I woke up this morning thinking that I might take a walk into Centro and look around because it was cloudy but not really raining. But once again my day had other plans for me. I took a shower and did my hair and everything (something I seldom bothered with) when Simone F told me that they would be going to the country side where their family houses are just to organise things for the next weekend and if I wanted to come I was welcome. I was a bit unsure of going but I am very glad that I did. We first went to Simone F’s parents house to pick up the keys. They live in a part of Firenze called Poggio Imperiale, on top of a hill. It is much quieter and private there and the houses have bigger plots with bigger gardens.Their house over looks a lush green little valley were you see a house on a hill every here and there, beautiful. It had just stopped raining so everything was still crisp, fresh and clean. I met Simone F’s parents and we had a quick caffé before leaving. We listened to typical italian opera and some classical music as we drove past beautiful little house in the more remote parts of Florence on our way to Piandiscò. We had about 20 min of highway on our way there which gave me a chance to see some of the old castles still standing on the hills. It shows you why you see all these beautiful but elaborate villas on top of hills, for the view and the meaning behind it. The places you pass through is so incredibly beautiful that it inspires awe with a twinge of sadness( I have no idea why these views bring tears to my eyes and tugs at my heart, there is nothing sad about it yet I feel sadness weighing down on me). I guess thats what they would call heartbreaking beauty. The hills look as if mother nature has thrown a thick lush blanket over them in these chilly times. The trees were full and heavy while the ground smiles with the abundance of new life spurting all around. It was magical. Before we reached Piandiscò, we passed through a small town called Vaggio, here you can see the true essence of what it is to be an italian by heart. It has not the outer pretence of fashion and style and elegance of cities like Firenze and Roma but it has a much more basic and natural charm. The country houses we were going to are just just on the other side of Piandisco, a typically stylish little Italian villages which holds a beautiful old pieve (small town church) 1100 BC. When we reached the right turn of to their place I looked to my left and through the tree i could see all the way down this steep mini canyon that was so lush and green with trees and nature. Their place is beautiful. There are three houses, a big one with three stories then there is a smaller one in a simular style and then next to that one is a beautifully quaint little typical tuscan house. At the side,descending into the canyon, is a path way that leads to an old cellar where they use to store wine. While I was stitting there with my back against the big house, I had the little lush canyon to my left, in front of me I could see fields of olive trees and to my right hand side sat the two smaller houses with a big lawn and soccer field and swimming pool(with a sona) beyond it. The sun had just come out and I basked in the welcome warmth thinking to myself how this place is perfect in its imperfection. The lawn is over grown with daisies and other beautifull plants growing everywhere but it carries effortless grace and natural beauty. We then go through the houses deciding which is more suitable for the party and of course we settle on the big house. So we start cleaning it and it pleased me greatly to see everyone of us get thoroughly involved with the sweeping, mopping, dusting, moving ect. When we were almost done, Angela started making lunch. They were on a high protein diet but they always keep me in mind when they cook which is extremely nice of them. She made a pasta with tuna, garlic, salt and olive oil; there was a big bowl of salad and then Simone F had made a fire in the fireplace in the kitchen were he then prepared a proper Florence steak(which is famous in Italy for being very rare and very thick) and some delicious sausages. We didn’t have bread because the shops were already closed but we still had our balsamic vinegar and olive oil for the salad. It was an amazing simple meal. We cleared and chilled in the sun for a while. I found a tennis ball and entertained myself for 30 min by throwing it in the air as high as I can and then catching it again, Simone F wacked some golf balls and other things and Angela went flower picking. On our way back we stopped at a petrol station were we went to the cafe for some caffe. I politely turned down and espresso and chose to walk around the area a bit but when I met them at the car later they had managed to buy me something in anyway. It was a typical italian biscuit called Cantuccini, they gave me a pack of softer ones and a pack of harder ones for tea. While gobbeling them down in the car on my way back I thought to myself that I will go running tomorrow weither it rains or not. When we got to Firence it was 4pm so we had an hur to kill before picking Camilla up at 5pm. They then took me to Piazzale Michelangelo, it was on a hill over looking the whole of Firenze. They then took me to San Miniato which was just next door, it was undescribable. You walk up with these big stone staircases on each side which brings you to the courtyard at the churches entrance. As you stand facing the church you have small areas of tombs and lawn and graveyard on you right. To your left you have a little ‘Monk Pharmacy’ as they call it. Inside you have a monk behind the counter with all sorts of aromas drifting around you. There was beautiful mens chior music playing in the back ground and a cookie caught my eye, it was called Bruto Ma Buono (“Ugly but good”). When we walked out there is a passage way just next to the entrance to the shop. It leads you on a beautiful root behind the church towards Piazzale Michelangelo(unfortunately it was closed this day). We the went inside the church. Words fail me. As you step in you tread on a marble grave which is then followed by more and more. The floor exists out of different marble graves and you find yourself treading softly, respecting the dead. High ceilings starting with marble at the bottom but the higher you go the older it gets and the stone walls show face.The walls are covered in paintings of men and the ceilings are covered with stories. We then went further and descended into a Cripta, were the graves of old family bloodlines lie, families like Galileo Galilei. You then go back up and ascend into the meditation chamers for prayers. This was my favorite part of this church. It was dark and the only light that entered was through a beautiful picture window. The walls and ceilings were covered with painted stories and at the bottem along the ground were dark wooden seats where you could snugly and pray in utter silence. The aromas of this place was entrancing and memorable. We were running late so we rushed out to the car and sped of to fetch Camilla from school. Simone F took a different road called Viale Dei Colli which took us through a old and beautiful part of Florence. We passed from the one side of the city’s centre to the other side through different porta’s. The city centre is surrounded by an old town wall which now has different entry points called potra’s (like a porthole into an unknown world of magic;) ). When we got home I immediately pulled the laptop out to write an email before i forgot all I had seen. I can now say with absolute certainty that I am head over heels in love with Tuscany. Last night we had a meal that existed out of olive oil, balsamic vinegar and black bread; Some sort of meat that is sliced into thin slices; Spinach fritata; a salad with fresh leaves, mozzerella, carrots and some other kind of veg; there was steamed asparogus; a whole bowl of fresh mozzerella; A slab of parmason with some apples and pears, last but not least there was a big bowl of chopped strawberries with a dash of sugar. This morning after I had walked Camilla (the daughter) to school, Angela (the wife) told me that she will be taking the bus to their office in the center of Florence. I eagerly agreed to go along and explore Florence Centro a bit. Now riding a bus in Florence, or Italy for that matter I presume, is like being on that bus from Harry Potter. Bumpy, jerky and over side walks but all together quite fun, if you are sitting down. But standing while holding on to a pole can be an embarrassing and comical experience. With the sudden stops and starts you swing to and throw while clutching your pole, making unintelligent grunts and little squeaks of alarm or surprise. The whole scenario made me feel like an inexperienced pole dancer. That thought had me trying to wipe a stupid grin off my face while trying to play it cool. All the while Angela just sits in the corner by the window, laughter dancing in her eyes while she is hiding a smile behind her jacket collar. At the front an old man is swearing at the bus driver and the bus driver is arguing right back at him. But they seemed to secretly enjoy their little exchange of words, behind their frowns amusement dances mischievously in their eyes. When we stopped in the city center, Angela and I greeted and went our own ways. The first thing I did was get a map of Florence. After about 30 minutes walk into the smaller and quieter alleys, I pass by this miniature church or at least it was one. The big double doors of this little place had big windows in it. As I peered in I could see statues after statue. Inside was only one big studio room with a high ceiling, wooden beams at the top and glass windows in the ceiling which allowed the sun beams to fall through making this little unlikely chapel-turned-workshop look holy indeed. The artists inside looked up from their work at me and gave me friendly waves, I waved back but I didn’t go in seeing that there was a clear sign outside saying ‘No Entry’. Not pushing my luck I stood back and admired this work of art for a few minutes more before I carry on my way. I got thirsty and walked into a little door were I saw water in the window. To my surprise and delight this little door turned out to be a full blown supermarket with anything and everything you can think of. Okay so it was very narrow and at places you had to use a ladder to get what you need but it worked, somehow. On my walk I met a Nigerian man who spoke beautiful English; got chatting to an American woman who tried to stoke a sleeping cart horse who then in turn bit her hand making her yelp(serves her right); and then got a sandwich at Queen Victoria who makes amazing Italian sandwiches. At 11:40 am I sat down on the steps of a church listening to a man play the violin. Before I new it, it was 12 o’clock and the bells all over Florence rang in harmony sending chills down my spine. There are about 1000 churches in Florence. In the streets you will always see subtle construction busy restoring and preserving these old buildings. At about 1 o’clock I started making my way to the bus stop when I smelt chocolate. As I came near the shop I saw that it was a shop dedicated entirely to chocolate and a woman was making fresh pasties on the side walk. Not being able to resist I got one. It looks like a hand size waffle but it is crispier. She put it in a carton box/ bag and then she starts throwing melted chocolate on. Dark chocolate, white chocolate, milk chocolate, mint chocolate, you name it. Mine had milk chocolate and dark chocolate and I thoroughly enjoyed this messy feast. I was a mess when I was finished but luckily I had a bunch of napkins and a bottle of water. Sitting on the bus going home, there was an open space in front of me. A man came to stand there with his back towards me when he got on at one of the stops. At one stage the bus took off with a start and the man falls back towards me. I instinctively but my hands out to break his fall and to protect myself. As it happens with me sitting and him standing, my hands are level with him backside and before I new it I was sitting with a strangers bum cupped in my hands. We both freeze and he peered at me over his shoulder, bewildered and apologetic, while I quickly release his bum like it was burning me. Embarrassed and with sheepish expressions, we both apologized while trying to stay casual. After a few moments of uncomfortable silence I take the cowards way out and put my headphones on and pulled my hoody low over my head. When I got off at my stop I start walking back looking at my surroundings. Its always entertaining looking at Italians park. Its amazing were these people think they can fit in. I was only when I got home that I saw I had a chocolate smudge the size of Africa on my chin. Hooray. Here I am in Florence at last. Safe and sound with quite a story to tell..
After my 10th and final greeting to my family, everything was going so well, until..
We had just taken off and I had switched my screen on to pass a 13 hour flight with some movies. But Murphy’s law had it that my screen, the only one on the whole plane I might add, was not working. Luckily the flight wasn’t very full so they moved me to a four seater that was miraculously available at the very back of the plane. I later gave my spot up to a father in distress with constantly red faced infant. At last I settled in a two seater by the window which was perfect because it was full moon and I’m a Cancerian after all. Staring out the window while blissfully listening to some movie soundtracks, I saw lightening below me. How amazing is that? Below me! Soundtrack + stars above + patches of city lights + full moon + lightening = an amazing feeling. Moving on. After a while when my movie and music supply ran out and I couldn’t sleep, I got bored. So those who are family, or who know my family, will know that we love to sing. Wether we can or not, wether it’s appropriate or not, we sing. So I sang. And seeing that the airline I was flying was called Edelweiss, the first song that popped to mind was none other than Edelweiss, a song from The Sound of Music. I was just humming the tune quietly to myself, closing my eyes and loosing myself in a world of singing in the hills and making cloths out of curtains. Suddenly the rather enthusiastic, burly swiss gent behind me heartily joined in at a splendid tenor tone. Courage quickly over rode my initial shock as I fell back in with him, singing with a little bit more oomph myself. A few verses later an old Lady at the other side of the plane joined our accapella and then, to my greatest delight, three more joined. We were not the best of choir but it was fun until a baby started crying and we all fell silent and went stiff, terrified of getting a tongue lashing from the mother. To our surprise and relief she only picked up her babe and hummed Edelweiss to it until it fell asleep again. With a sigh of relief and a twinge of embarrassment I sank down in my chair. Having had quite enough excitement for the day I closed my eyes for a nap. About two hours before Zurich, we passed over the Alps. It was a sight of pure fiction. The sun was out and white peaks peered at me through thick clouds, teasing me with mere glimpses. At times I could see right through the clouds for a few blissful seconds at the unknown world beneath but then the clouds would snap shut again like a scandalized nun who just caught a boy peeking up her skirt. When we landed in Zurich, everything about the trip had been acceptable up to the point. But right then and there my life’s karma decided to catch up with me. Swiss customs decided I looked suspicious and the fact that I had more liquids in my hand luggage than permitted didn’t help my case. So I was taken aside were my luggage was neatly unpacked, object for object, for the whole freaking Switzerland to see. And to make things even more peachy, I was thoroughly frisked by a scary Swiss lady, who looked more German if you know what I mean. I was terrified and so far not impressed with my first solo international trip. By the time they were finished with me and I was free to go, I was sweating and overheated and ready to faint with relief. So I dragged myself to the nearest bar were I had a big glass of water and a bigger glass of wine. I then set off looking for my next boarding gate. On the board it said my flight to Florence would be boarding at gate A/B. Thoroughly confused seeing that gate A and gate B were on opposite sides of the terminal, I set of in search of gate A/B. Along the way I found an officer who told me in a heavy accent that it would either be gate A or gate B, they haven’t decided yet. So he pointed me in a direction and started walking in that very direction. So I followed him, naturally. He kept throwing me, what I know now to be suspicious glances, over his shoulder as he quickened his pace but I kept pace with my night in shining armor. It was only when I tried to follow him into a restricted area that he turned around and politely asked me why I was following him. Embarrassed, all finesse vanished as I turned around abruptly like I had not heard or seen anything, and walked away casually. Not one of my smoothest moments I admit. The flight from Zurich to Florence was terrifying and nauseating to say the least. The pilots were two beautiful men who looked like they were at boarding school, eyes full of mischief. They quickly lost their charm as the flight started. It was bumpy, shaky and unpleasant. The weather in Florence was to bad to land so we barely made it alive to Pisa airport. Upon landing the whole plane burst into applause and a few tears were shed in relief. When we came to a halt one of the pilots appeared to apologize for the rough trip with an all to sheepish grin on his face. I would have laughed at the absurdity of the situation if I didn’t feel like retching. We then waited an hour for a bus to take us to Florence. It was a nice relaxing drive. I sat at the very front with a beautiful view and the air-con on full blast as the driver played “You Can Leave Your Hat On” loudly on the stereo. Things were starting to look up. At one stage the bus driver put his phone on loudspeaker and had an intense conversation for the whole bus to hear. Luckily for him most of us didn’t understand Italian but the Italian lady next to me had a good chuckle however refused to share the joke. When I arrived at Florence airport I went straight to arrivals but found no-one there. So I went to information to ask for internet/sim card/pay phones but they had nothing anywhere. Distresses I camped out at arrivals for about an hour, trying to come up with a plan but none came to me. I then got angry and went back to info to drill them a bit and found out that there was still internet cafe’s open at the train station. So taking my bags, which I had been dragging around with me the whole day I might add, I went in search of a shuttle. Luck had it that I walked into Simone Ferradini and his daughter, Camilla, just as they were about to leave after waiting for hours and hours. Relief flooded me and I almost burst into tears. When we got to Casa Ferradini I met them all: Nono and Nona (the grandparents), Angela (the wife), Paolo (Angela’s brother) and Alessandro (the little boy). I could barely keep my eyes open as they lay a feast in front of me. I could also barely eat and I’m afraid I might have offended Nona, who was the cook. The next day Simone F, Angela and Camilla took me to the center of the city, despite the heavy rain, which I thought was very nice of them because I was ever so curious. We went for a cafe (espresso) at a little cafe were we all put our umbrella’s in a big bin outside. They took me to one of the most mesmerizing churches I have ever seen, Santa Croce. It was filled with beautiful paintings, picture windows, candles that gave of an intoxicating aroma and there where also loads of graves of important politicians and poets. When walking through the surprisingly busy cobble stone streets one had to lift ones umbrella up every now and then to avoid collision, making every second person look like Mary Poppins too me. We the passed by and through Piazza Signoria and La Vasta Vecchio (an old government building where every now and then there was a market of a sort). On our way to Punte Vecchio (famous bridge in Florence with all the jewelry shops) we passed the Galleria Degli Uffizi, which was to busy to go in. After the bridge we went through Piazza Rupablica and right past the Duomo, which was breathtaking. 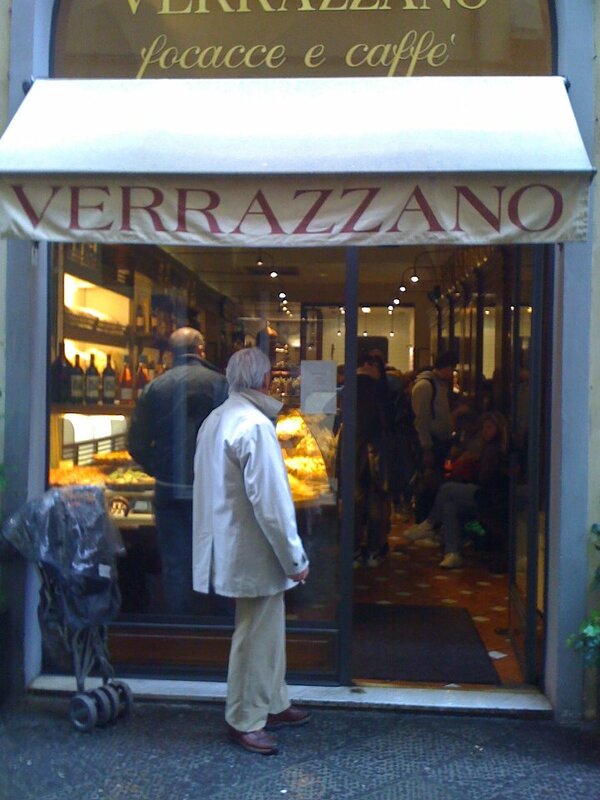 We then ended up at a little cafe called Verrazzano for a quick bite. Angela, Camilla and Simone F at Verrazzano as we took our pit stop. All in all it was a wonderful day. That night we had a feast of note to celebrate easter and what an experience. Will need to dedicate a few pages to that alone so for now all I will say is amazing. After dinner I went for a walk, something that you can’t do on your own or at night in South Africa because of crime levels. In front of their house is a cobble stone courtyard with benches and olive trees strategically placed at random from the edge to about halfway in, leaving the center open. 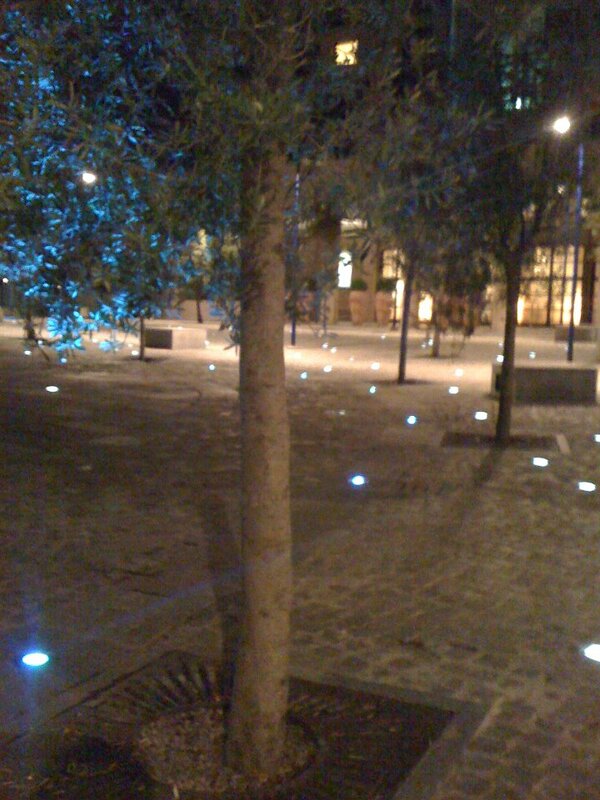 Every step or so there is a light, the size of a cobble stone, in the ground shining like stars. When looking out of my window on the fourth floor it looks like a galaxy hiding just beneath the surface of the earth, peeking at us. Courtyards in front of the apartment. Day two Simone F and I cycled Camilla to her horse riding school, Casa Di Risparmio Di Firenze, where we were joined later by Angela and Paolo. We had an espresso there then we were off. Paolo took me to show me the center of the city on a sunny day. It was beautiful. We stopped every here and there to look but kept on the move most of the time. We stopped for an ice cream at an amazing gelato’s called Grom. I quickly became addicted to their Vanilla and Pistachio. 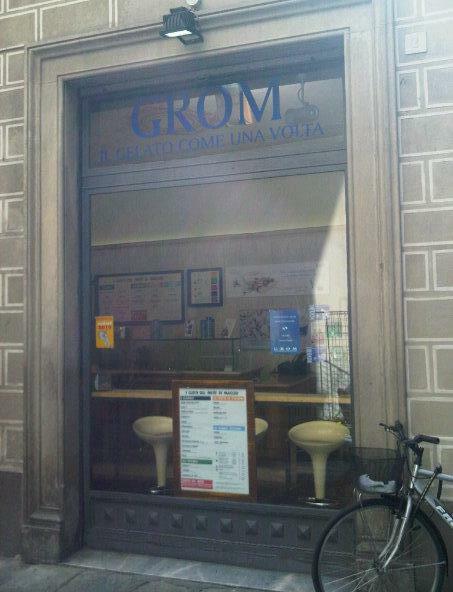 Grom in Florence, best gelato ever. 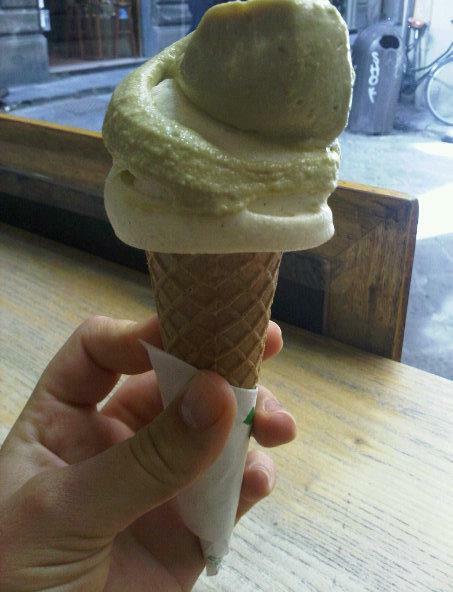 Vanilla and pistachio gelato from Grom. Addictive goodness. We the passed threw a few more Piazzo’s like Piazzo Pitti (where the fashion shows are held in summer hosting designers like Valentino and Armani) and Palazzo Santo Spirito (the oldest church in Florence). At the end of the day we had done more than 15 km of cycling and I still felt fresh. Tonight we had another memorable meal, I went for another walk while taking the garbage out and here I am now, 1 o’clock in the morning and knackered.